This is pretty good stuff, but you might not think so as it cooks. Straight from the freezer this is a mixture of the frozen gnocchi (small flour dumplings) and frozen flying-saucer-shaped chunks of sauce. Heating in the microwave is a two stage process. After heating for 4 minutes, the mixture needs a good stir. At this point you’ll wonder, what have I done wrong, as the sauce and gnocchi appear very watery. After stirring, put it back in the microwave for another 3 minutes and the magic happens. The second heating totally changes the appearance, by thickening up everything into a coherent whole. Pan heating instructions are also provided. Throughout the cooking process the gnocchi retain their consistency. After heating they have a nice chewy texture in the mouth. The sauce thickens nicely thanks to the cheese in the sauce (that’s the magic). This allows the sauce to coat and cling to the gnocchi. 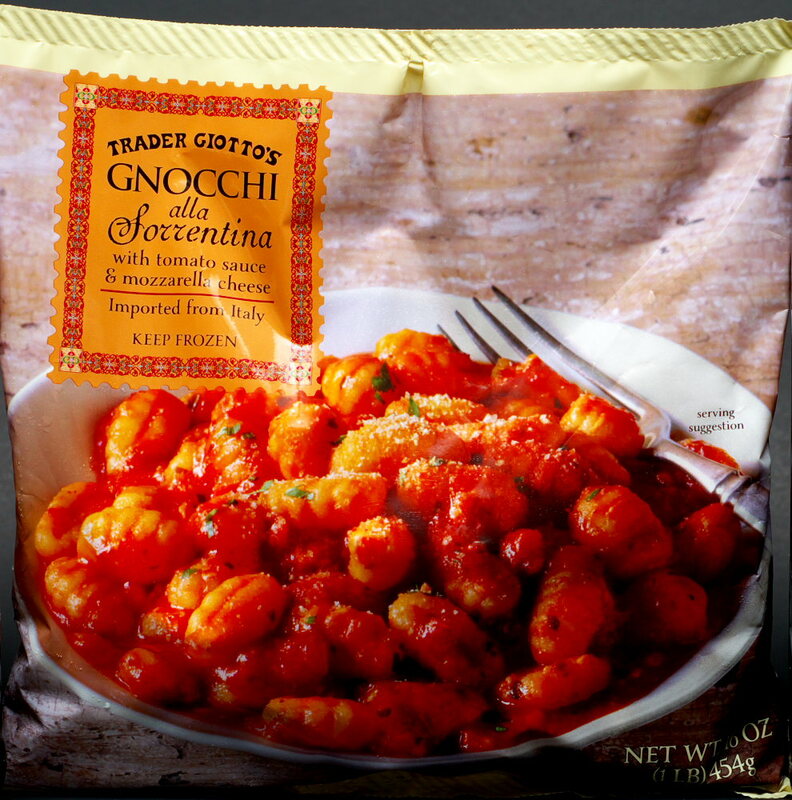 The combination of the complex, but not over the top, sauce and chewy gnocchi works extremely well. A sprinkle of parmesan is always useful, but really not needed. For us, the package yielded two modest servings working out to around 300 calories each. 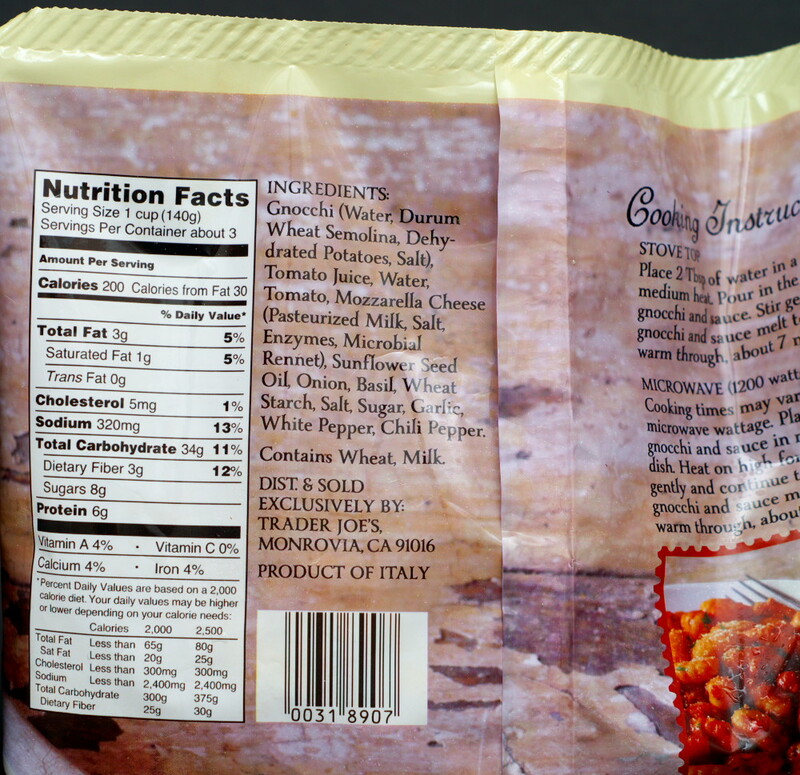 The package claims three servings. Even though our portions were only 300 calories, the gnocchi were very filling – and tasty. This entry was posted on 08/06/2017 at 11:13 and is filed under Recipes, food, cooking and related items, Trader Joe's. You can follow any responses to this entry through the RSS 2.0 feed. You can leave a response, or trackback from your own site. I just found your blog, had already bought this on my last trip and I love it! I had it with TJ’s amazing Jasmine rice (frozen in a box) and it’s SO good I just had it for dinner again today 😊! have a bad obsession with traders joes. I have yet to try this. It actually looks really good though. Yum! Good review. I love tomato based gnocchi. They do sell a plain gnocchi by the pasta to which you can add your own sauce. Almost as quick too. Just boil water. Have you tried the sweet potato gnocchi? I’ll trade pasta for wine any day. The gnocchi isn’t TJ branded.